Canterbury maintains one of the oldest and most celebrated choral traditions in the world. Today the Cathedral is host to a vibrant music community – enriching worship and inspiring people. 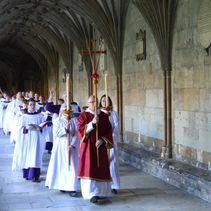 The annual pattern of over 1,600 daily sung services at Canterbury Cathedral attracts local, national and international audiences. Furthermore, millions of people worldwide are also able to appreciate the sound of Canterbury through radio broadcasts, recordings and tours. For the pilgrim, Canterbury is hugely important and music provides a welcoming and inspiring experience that transcends language. You can plan your own visit here and view the latest details of services. Our choral music tradition has been supported throughout the centuries by a succession of pipe organs, and indeed has heard the echo of such an instrument within its walls for more than a millennium. During that time, they have undergone renewal, repair and relocation at frequent intervals. Today, our main organ, housed in the Cathedral’s Quire, has reached the end of its performing life and needs urgent attention. Led by the Trust, The Canterbury Voice is our new £10m campaign launching in 2018 to create a sustainable future for music at the Cathedral. It will build on both the successes of The Canterbury Journey and our longstanding choral music traditions. Through these renewed efforts, we will ensure that the creation and performance of music remains central to our mission for the centuries to come. Delivering the Cathedral Organ Project – restoring and enhancing this vital instrument as well as the surrounding failing 12th Century fabric of the Quire. Adopt a Stop! today to support these urgent efforts. By creating a series of endowed funds we can ensure music is sustained for the future of Canterbury Cathedral and all who enjoy music here. This includes choral scholarships and bursaries so that, regardless of means, young people with exceptional talent can become Canterbury Cathedral choristers. As well as reinstating the Organ Scholarship, we will also be seeking to create a new music commission fund, supporting the Girls’ Choir and improving choir rehearsal facilities for all who perform at the Cathedral. Find out more about these new funds here, or by contacting the Trust. 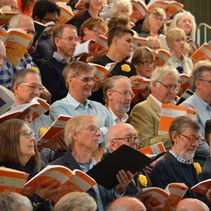 The Your Voice fund is particularly special, giving people the opportunity to endow their chosen day of music with gifts from £1,000 each year or a larger pledge to celebrate Your Day in perpetuity. In this way, we can sustain our musical heritage for generations and you will know that your gift will be honoured each year at Canterbury. Delivering a reinvigorated music outreach programme both at the Cathedral and in the local area. This will provide new opportunities, working with local partners, for people to discover their own meaning of music. The creation of new endowed funds with reliable returns will give the flexibility to develop this exciting new initiative. Find out more here or contact the Trust. 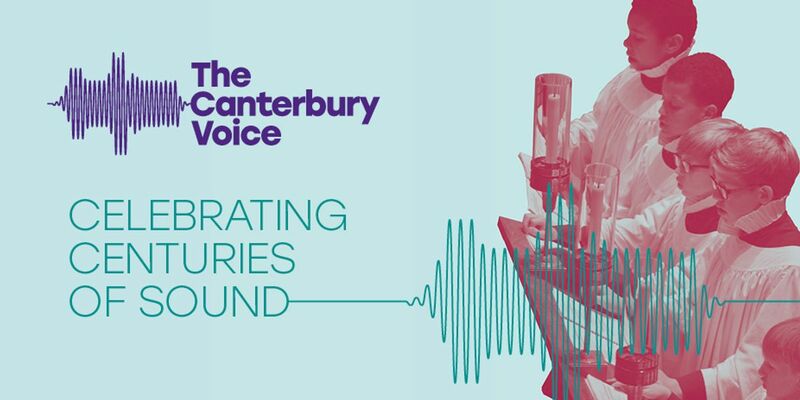 The Canterbury Voice will meet the vision for music at the Cathedral through the delivery of urgent capital works and by securing sustainable funding dedicated to music. 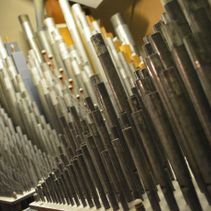 Our schedule has been guided by the absolute deadline of the Cathedral Organ Project. The Cathedral’s main organ has reached the end of its life and its restoration begins in January 2018. It must be completed ahead of the Lambeth Conference here at Canterbury in July 2020. 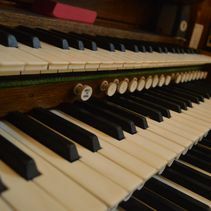 The Cathedral Organ Project has therefore served as a catalyst for us to address the future of music at Canterbury Cathedral more widely, including planning for a future of sustainable support. Wider outreach plans and scholarship programmes will be renewed and enriched in tandem with the Cathedral Organ Project, but also continue far beyond 2020. The project will take place between two important milestones for the Cathedral, with works beginning on-site in 2018 during our 30th anniversary as part of a UNESCO World Heritage Site and completing in 2020, as the Cathedral celebrates 600 years as the home of a permanent choir. Find out more about this project including a detailed delivery schedule here. Please check back regularly for the latest news of this exciting campaign. Read more about the Trust’s work in our 2017 Annual Report, and find out how you can support us. Peter and I care deeply about the preservation of historic and linguistic treasures for future generations. I can think of no finer example than the choral music tradition performed daily at Canterbury Cathedral. Echoing the seventh century monastic chants yet understandable and inspirational to listeners today, we are delighted to support these efforts through the Marit and Hans Rausing Bursary Fund. This provides both the opportunity to hone a young boy’s natural talent in choral music and to honour my parents with a lasting legacy at such a fine institution. 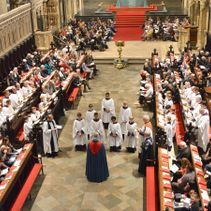 The Canterbury Voice will sustain the Cathedral’s musical future. To continue celebrating centuries of sound, we need reliable funding to support both daily music and our future aspirations. Building dedicated endowed funds will ensure our choral traditions are not compromised.